Flashmobbing all the way across the north! Our latest venture went VERY well! Read on and watch our video to find out more! Shoppers trying to beat the Christmas rush were rewarded with an early Christmas present last week when students from Carlisle College burst into a flashmob of dance. Eight eager students performed live to the beat of a Dhol Drum at The Lanes Shopping Centre, Carlisle, on Friday, November 11. The youngsters were appearing as part of Dance Across the North (D.A.N) – our Strategic Touring Programme of workshops, flashmobs and live dance shows which has been travelling throughout the north of England over the past year. The project has already wowed audiences and participants in North Lincolnshire, East Yorkshire, Cheshire, Northumberland, Lancashire and County Durham. Friday’s event was organised in conjunction with Highlights Rural Touring Arts and led by dancer Julious Ebreo. 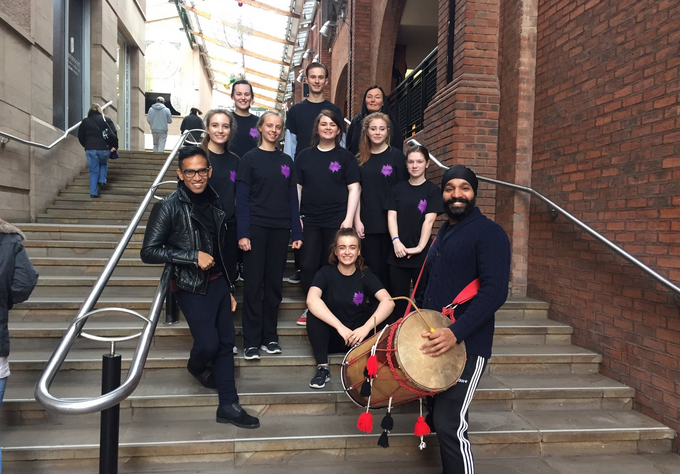 Julius worked alongside apprentice Laura England, dance consultant Gail Ferrin, of Get Moving and Paula J Horton, Associate Artist, Blaize to deliver an awe-inspiring event, complete with music from dhol drummer Balwinder Singh. The flashmob precedes a live performance from BSDC due to be staged at The Old Fire Station on Thursday, November 17.